Meet the "King of the Arctic!" Our flagship polar bear tour is an expertly guided small-group adventure to see the world's largest concentration of polar bears in their tundra habitat along Hudson Bay. An expert photographer-naturalist leads this immersive journey into the realm of the polar bear. Capture memorable images on this highly popular expedition. A total immersion into the world of the polar bear! Learn about the Northland’s culture and history, visit a polar bear den, survey the tundra by helicopter, and view polar bears from our Polar Rover tundra vehicle. Stay at our exclusive Tundra Lodge for unparalleled seclusion and proximity to wild polar bears—then add two nights in the historic hamlet of Churchill to experience the culture of the Canadian North. Stay among polar bears around the clock at our mobile Tundra Lodge, located each season in an area of high bear density. This is arguably the most extraordinary polar bear tour in the world! 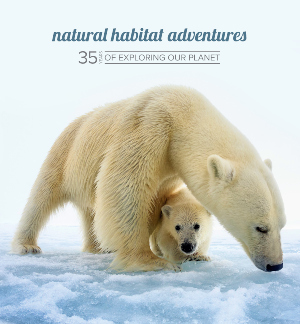 Join renowned wildlife photographers to capture phenomenal images of polar bears. Our custom-built Tundra Lodge offers the ultimate in proximity. Look for Arctic wildlife on the tundra, search for polar bears from a thrilling helicopter flight, take an authentic dog sled ride, and meet Churchill's hardy local people. Photograph Katmai's famous grizzlies once Brooks Lodge closes and visitors disappear—we fly by private floatplane to watch them fatten up on the salmon that remain! Churchill, Manitoba is one of the best places on the planet to view the aurora borealis—see it in comfort from our exclusive Aurora Pod featuring a 360-degree view of the night sky. From giant pandas and golden monkeys to travertine waterfalls and the Tibetan Plateau, our photo tour is a montage of China’s natural splendors. In this biodiversity hotspot, virgin rain forests shelter monkeys and tropical birds while gigantic blue whales cruise offshore. Discover World Heritage wonders of nature and culture found nowhere else. Explore mountain heights and jungle lowlands on this soulful journey through the cultural and wildlife treasures of two neighboring Himalayan nations—including rhino tracking in Chitwan National Park. A natural adventure Down Under combining rare wildlife encounters with the South Island's stunning mountains, glaciers, fjords, coastal rain forest, remote islands and legendary hospitality. A rain forest discovery for all ages! Choose from exciting activities like zip lining, horseback riding and float trips as you explore Costa Rica's tropical wild side. From rain forest birding to cloud forest trekking, jungle river running to tropical beach lazing, let us help craft your dream nature escape to Costa Rica! Witness millions of butterflies during their winter migration to the highlands of Mexico. Capture superb photos with tips from our expert photographer guide. Join Nat Hab founder and president Ben Bressler as we cruise, kayak and hike among the giant whales and wildlife of Baja's Magdalena Bay from our expedition ship base camp. Look for monkeys, tropical birds and other jungle wildlife amid mountains and waterfalls, canoe subterranean caves, and snorkel from a private island over the world's second-longest barrier reef. Embark on an active adventure exploring remote and spectacular landscapes and atmospheric luxury lodges throughout the Swiss Alps—without missing any of Switzerland's famous must-see sites! Sail the blue Adriatic aboard a private yacht, kayak the sun-soaked islands of the Dalmatian Coast, and explore the forests, lakes and waterfalls of Croatia's mountainous interior. Travel with polar experts aboard a small expedition ship—encounter prolific wildlife and colossal icebergs amid the matchless wilderness of the Antarctic Peninsula. A comprehensive voyage to the wildlife-rich Falklands and historic South Georgia, where a million-plus king penguins reign—plus the Antarctic Peninsula! An in-depth immersion in the polar landscapes, rich history and wildlife spectacles of these legendary islands in the Southern Ocean. Just 600 miles from the North Pole, Svalbard offers one of the best opportunities to see polar bears in their natural habitat, on the sea ice. Explore the nooks and crannies of Norway's fjord-carved coast and continue to High Arctic Svalbard, home to polar bears and abundant northern wildlife. Cross the North Sea in the wake of legendary explorers and Viking seafarers, sailing from Norway’s famous fjords to the Shetland and Orkney Islands. Trace pioneering routes in the far northern reaches of the Arctic, including the quest for the legendary Northwest Passage, as we sail from Greenland to Baffin Island. Enjoy magical close encounters with enormous gray whales in the warm waters of the Baja Peninsula, which are their winter breeding and nursery grounds. Explore the "world's aquarium" as we cruise, kayak and snorkel clear waters filled with a dazzling array of marine life—whales, rays and 900 fish species! Sail across the South Pacific, from isolated Easter Island with its mysterious statues to idyllic, rarely-seen atolls and romantic French Polynesia. Explore tropical rain forests, wander pristine beaches, snorkel over colorful reefs, and cruise the legendary Panama Canal on this small-ship nature adventure.